Photo of me speaking, fighting the sun, provided by Camilla Choo. Original photo on Twitter. In a departure from the other times I have given this talk, I gutted all the slides with code samples as well as the slides on testing (although I did keep them handy and use them for the individual Q&A afterward). Instead, I added a section showing example selfish user stories, some persona bits, and other references. Overall I think it was a great fit. I met the time limit and didn’t seem to overwhelm the crowd with technical bits. I hope everyone attending got something from the talk, but based on a few conversations afterward I think I struck a chord with at least a handful. Anyway, my slides are below. If you want to see the slides I excised, then you should look at the my slides talk I gave a few days beforehand for Accessibility Camp Toronto (start at slide 46). There was no video from this talk, so you have to take my word for it that it went well. I was warned in advance that the crowd would be tough — they wouldn’t laugh at my awful jokes (nor the good ones), wouldn’t ask questions, and in general might be hard to read. That was wrong. The room was great and was easy to engage. I think it helps everyone was hoping to learn something new on a topic that many hadn’t considered before. I’ve tagged all my UXSG photos on my tumblr, but I’ve included some of my favorites below. Breakfast bits on the first day of #uxsg. Tasty breakfast and tea snacks continued throughout. 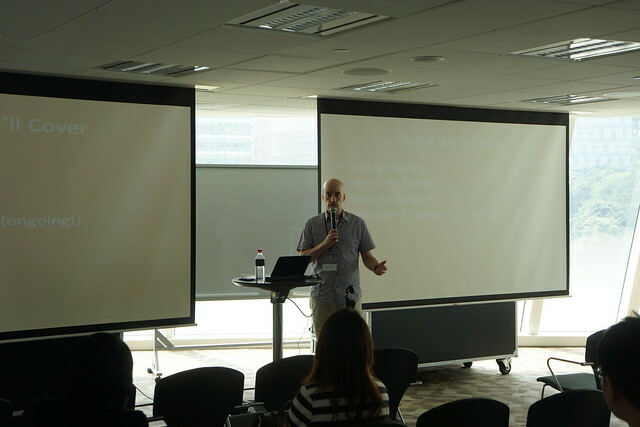 In Bryon Long’s #uxsg lean startup session, he identified being bald and dating as a type of problem. #uxsg In “think like entrepreneur” session, @trentmankelow asked each of us to draw ourself. We were also asked to add some fact unknown to the group. I mentioned my durian fascination. Cutting my #uxsg slides down to 75 after chats today. On a rooftop bar with various animal satay and a Generously Scarlet. The Donnie-Darko-style #uxsg Super Garang looking on after the end of the conference. Eventifier tracked all the tweets from the event, including photos. Making the Web More Human from Nurgul Karadeniz. This replaces a Flash embed from a Flickr album covering my talk. You can just view the album at Flickr as that is probably easier anyway.